Blamires (b. 1916) is an Anglican theologian and novelist. He was a personal friend of C.S. Lewis who was his tutor at Oxford University. His most well-known book is The Christian Mind, but he wrote many others having to do with proper Christian thinking and living. 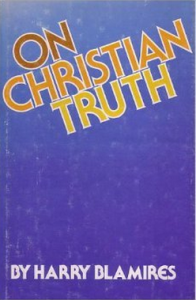 A typical quip is this: “The most familiar objection to the Christian faith is expressed by the question, ‘How can you believe in a good God when there is so much evil in the world?’ I sometimes wonder why we don’t more often hear the question, ‘How can you deny that there is a good God when there is so much good in the world.’ The very fact that we are by nature tempted to ask the first question and not the second question is in itself a kind of proof of divine providence. For it shows that we are surprised, not by good, but by evil.” We read books by our Anglican friends, not for theology, but for a more Christianized culture!